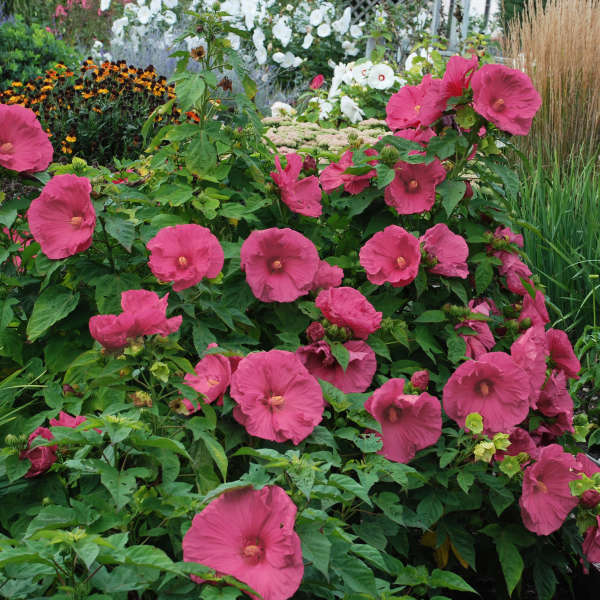 Huge 9 inch wide flowers that blend pink, purple and red shades will delight your garden from midsummer to early fall. Jazzberry Jam Hibiscus is a semi-woody perennial plant will certainly become the focal point of your summer flowering garden. The upright growth habit is a striking backdrop for other flowering perennials such as coreopsis, agastache, blackeyed susan, and shasta daisies. Part of the rose mallow family, this hibiscus is one of the last perennials to begin growing in spring, but their fast growth provides a beautiful specimen quickly in summer. Plant in full sun with moist, well drained soil. Jazzberry Jam Hibiscus is grown in a one gallon pot and ships June & July as available. Plants shipping to AZ and CA addresses will be bare rooted and root washed before being prepped for shipping.